What a difference a week can make! Last weekend, New York City received five inches of snow. This weekend, as winter officially arrived, the Big Apple experienced record-breaking warmth. On Saturday, according to the NWS, the temperature in Central Park reached 65°F – a new record high for the date. The previous record of 62°F was set in 1923 and tied in 2011. On Sunday, the mercury continued to soar and the city’s temperature reached a balmy 71°F. This shattered the old record of 63°F set in 1998. The average high for this time of year in NYC is 41°F. These unseasonably high temperatures were the result of warm winds moving into the area from the south as the jet stream retreated to the north. The mild weather is not expected to last much longer, though. Colder – even below average – conditions are expected to return tomorrow as a cold front moves into the region. This past November brought unseasonably cool conditions to most of the United States, including here in New York City. The rest of the globe, however, experienced exceptional warmth. According to the National Climatic Data Center, November 2013 was the warmest November ever recorded for the entire planet. 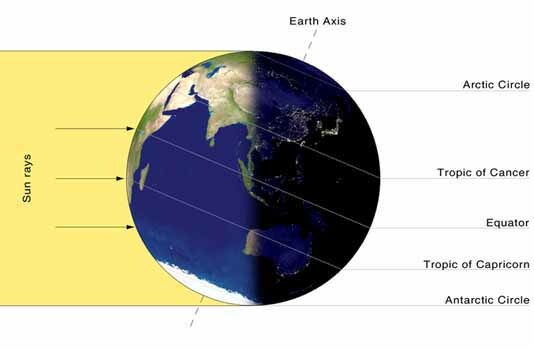 Earth’s combined average temperature for the month – over both land and sea surfaces – was 56.6°F. That is 1.4°F above the 20th century average. This November was also the 345th consecutive month that our global temperature was above its long-term norm. While heat dominated most of the planet, Russia was particularly warm. Some parts of the vast country, including the Urals, Siberia, and the Arctic Islands in the Kara Sea, posted temperatures of more than 14°F above the monthly average. As a whole, it was that nation’s warmest November since record keeping began in 1891. Year to date, 2013 is now tied with 2002 as the planet’s 4th warmest year on record. A massive winter storm stretched across the U.S. from Missouri to Maine this weekend. In New York City, it brought us our first significant snowfall of the season. According to the NWS, Central Park had 5 inches of accumulation. That brings our snow total for the month up to 6.5 inches. 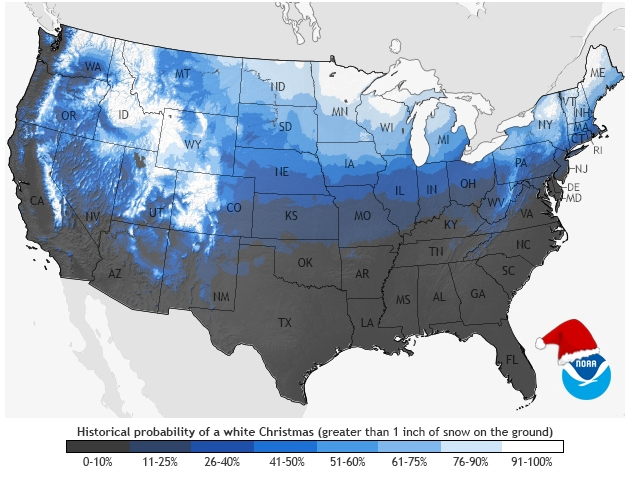 On average, the city usually receives 4.8 inches of snow for the entire month of December. While we are just half way through the month, these numbers mark a substantial departure from last December’s total of only 0.4 inches of snow. It’s beginning to look a lot like winter in New York City. Cold temperatures and snow have been dominating the weather for days. On Sunday, 0.7 inches of snow dusted Central Park – the first measurable snowfall of the season. Yesterday, a second weather system brought the Big Apple a wintery mix that included 1.4 inches of snow. While this modest accumulation is nothing to write home about, it did set a new daily snowfall record for the date. According to the NWS, the previous record of 1.3 inches was set in 1932. The arctic air ushered in by this second system is expected to stick around for a while. Temperatures are not likely to climb out of the 30s until early next week and more snow is possible over the weekend. 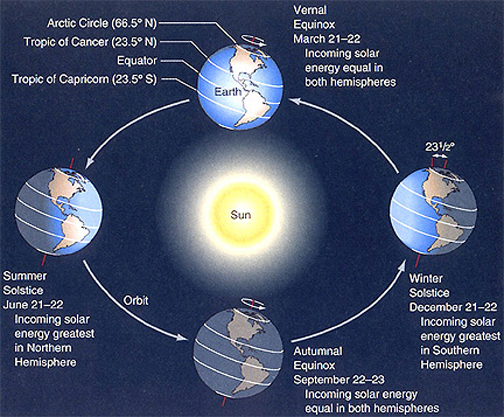 Winter officially begins on the solstice, December 21st. What Would Happen if All the Ice on Earth Melted? Sea level rise is a significant consequence of global warming. It poses serious problems for coastal communities around the world. According to the IPCC, average global sea level has risen 7.5 inches since 1901. While that may not seem like a lot, every inch counts when a storm surge rushes inland – as we recently saw with Sandy and Haiyan. As our atmosphere continues to warm, land-based ice, like glaciers and ice sheets, are expected to continue to melt and push sea levels even higher. Exploring this idea, National Geographic recently published a series of artist renderings that depict what the world map would look like if all the ice on the planet – approximately five million cubic miles – melted. Producing a sea level rise of 216 feet above current levels, entire cities would be submerged and the familiar outline of the continents would be irreparably altered. While this dire situation is not expected to happen anytime soon, these images offer an incredible visualization of what could ultimately happen to our coastlines if the atmosphere and oceans continue to warm unabated. 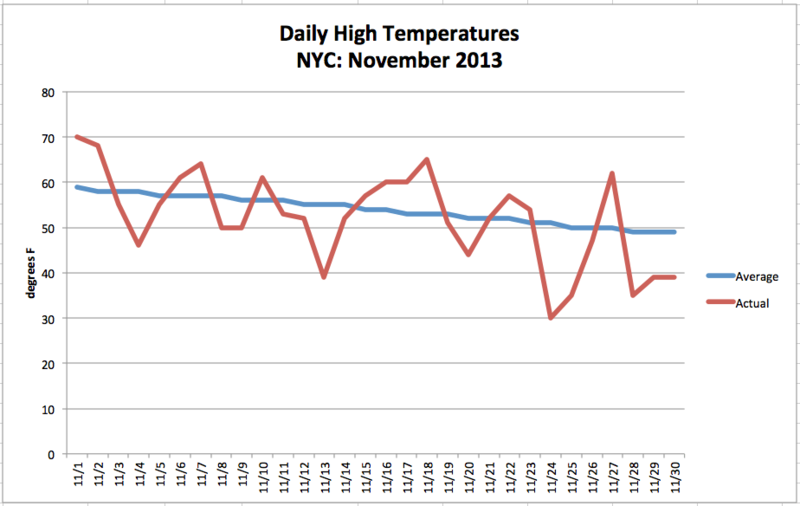 New York City was on a temperature roller-coaster this November. We had highs that ranged from a warm 70°F to a brisk 30°F. The chilly weather won in the end, though. The city’s average monthly temperature was 45.3°F, which is 2.8°F below normal. On the precipitation side of things, the city saw its first trace of snow for the season, but remained mostly dry. While we received 3.15 inches of rain in Central Park, most of it fell during a nor’easter just before Thanksgiving. Despite this late soaking, the city was still 0.87 inches below normal. 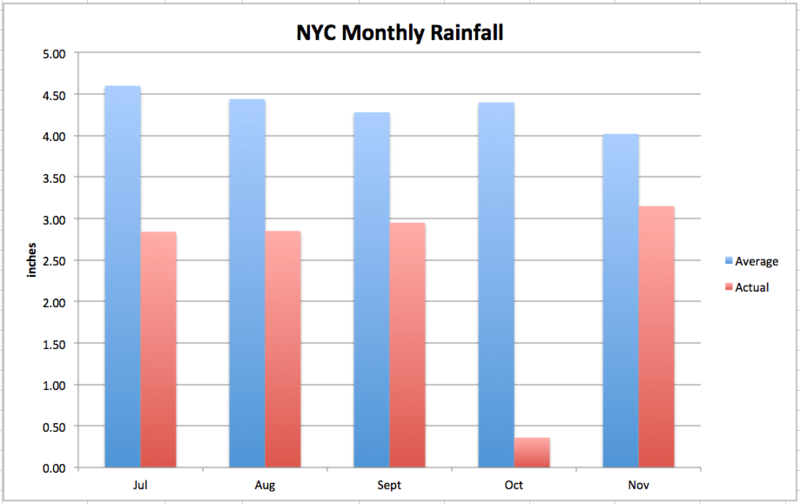 November is now the fifth consecutive month that NYC received below average rainfall.